Le Club Accorhotels has launched a rate plan targeted at business travelers that stay at Pullman hotels. You get 500 bonus points, breakfast and some other extras for booking this rate plan and staying between February 5 and December 31, 2015. If you would pay for these services that are included in the rate plan nevertheless and the price is not overly inflated, it can make sense to book this offer and collect the bonus points. Offer including accommodation, buffet breakfast served in the restaurant, internet access, ironing services, 500 bonus points awarded for Le Club Accorhotels members at the time of booking. Offer valid at participating Pullman hotels. The loyalty card number must be provided when the reservation is made and must be presented at check-in. The bonus will be credited automatically five working days after the end of the stay. 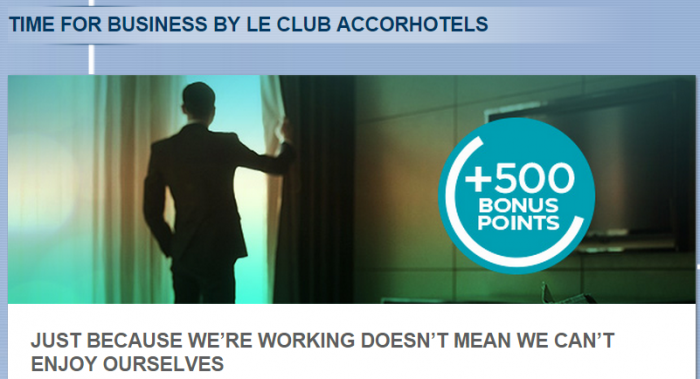 If the guest joins Le Club Accorhotels during a Time for Business By Le Club Accorhotels stay, the bonus will not be credited. Le Club Accorhotels general terms and conditions of sale apply to this offer. Ironing service for 1 item per stay per room. The prices mentioned do not include local taxes or supplementary charges (to be paid directly to the hotel) and may vary according to the dates and the hotel’s terms and conditions. No cancellation charge applies prior to 18:00 (local time). Beyond that time, the first night will be charged. This offer does not apply to groups and cannot be used with other promotions. 1. General Le Club Accorhotels terms and conditions apply to the “Time for Business by Le Club Accorhotels” offer. 2. This offer is valid for a stay between February 5th and December 31st, 2015 in one of the participating hotels and booked between February 5th and December 31st, 2015. 3. The stay must be booked at the “Time for business” rate. If this rate is not available, the member cannot benefit from the offer. 4. This offer entitles Le Club Accorhotels Loyalty members, regardless of their status, to benefit from earning 500 points in one of the participating hotels. 5. To benefit from this offer, your booking must be made on Accorhotels.com or our participating brands web sites, or via our Accor call centers. All other reservation channels will not be eligible to this offer. 6. You must provide your loyalty card number or member number when making your reservation, and present your card at the reception desk of your hotel when you check-in for your stay. 7. Bonus Le Club Accorhotels points are credited to the member’s account within 10 days following the end of his/her stay.